1. Is it me or the "Run to user code" not working? It seems that I could not make x64dbg pause at user code. Is it a bug? 2. Could you comment out the "SetForegroundWindow" in cbStep()? I have a plugin which is a dialogbox that has 2 button "Run" and "Pause". 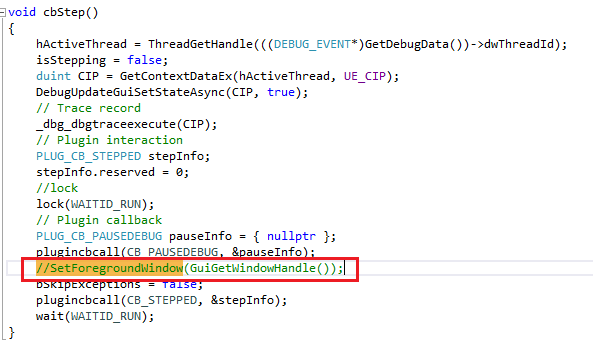 When it is in running mode, it continuously calls "eSingleStep", SetForegroundWindow in cbStep() is called and makes the main window form active. Since then I could not press the "Pause" button on my dialogbox because the main window is always active and the dialogbox is always inactive. Now, run to user also never worked for me. An alternative solution is to call "TraceIntoConditional mod.party(cip)==0"
Probably I will make an option at some point, multiple people have complained about this already. Thank you. I will open issue next time. Hopefully, you will make an option soon because calling SetForegroundWindow on dialog causes it active, but immediately it again switches to main window. It continues switching between dialog and mainwindow and I still could not click pause button. Hehe, Olly 1 has similar issue - when running script that's using breakpoints/single steps in a loop (simple example - tracing some VM), olly keeps calling SetForegroundWindow. This gets bloody annoying if you want to do something else while the script is running. Thanks Ted. It's a good tool, unfortunately it's not working in my case. It's switching between mainwindow and my dialogbox even with superpin enable. While waiting for mrexodia to add an option, I can compile a custom x64dbg that fits my use.